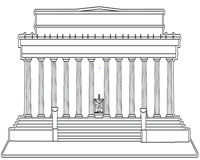 This set of printable American symbols and monuments coloring pages for grades 1 through 5 includes realistic outline drawings of the Bald Eagle, Great Seal, American flag, Statue of Liberty, the Washington Monument, Lincoln Memorial and many more. Did you know the bald eagle is actually not bald? It is called so because of the color of its head! 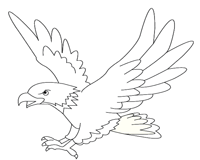 The bald eagle coloring page is fun to color and helps develop important skills in grade 1 and grade 2 kids. This great seal coloring worksheet gives kids of grade 5 a hands-on experience in coloring intricate designs. Provide factual details and direct kids to take special care in identifying the components and color them. 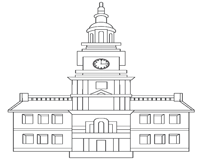 Make your world more colorful with this printable coloring page of the Independence Hall. Blend history and fun by giving children information about the signing of the Constitution and the Declaration of Independence. 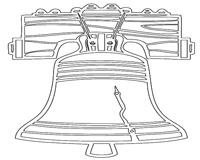 Did you know, the Liberty Bell was used to summon lawmakers to legislative meetings and cracked the first time it was rung? Bust boredom with this Liberty Bell coloring page and furnish kids of grade 2 with more significant facts. Ever wondered who chose the Rose as the national flower? It was Ronald Reagan. 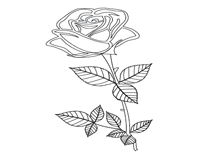 If it is a simple and easy coloring page that you are looking for, then try this national flower coloring page and refine coloring skills of grade 1 kids. 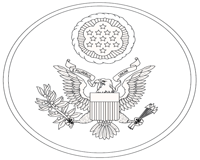 Uncle Sam (initials U.S.) is a common national personification of the American government. 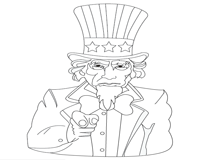 Fifth-grade kids color this portrait of Uncle Sam wearing a tall top hat, blue jacket and pointing straight ahead in this coloring page. 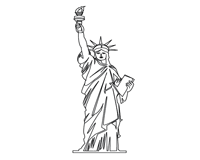 This colossal Statue of Liberty was a gift from the people of France to the Americans. 3rd-grade kids can find out how it has changed color from brown to green, color the picture and discover little-known facts as well. Color this historical landmark in the United States of America that was built to commemorate George Washington. Warm-up the creativity and imagination of fourth-grade kids with this coloring activity. Here is an exciting coloring page that will bring a smile to your animal lover's face. 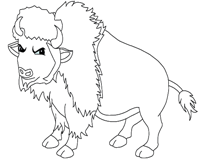 Enhance the creativity of your little artists as they color the bison using appropriate colors and refine eye-hand coordination of grade 1 and grade 2 kids in the process. This one is good for fifth-grade children as there are many intricate line drawings depicting a striking view of "Gateway to the West". Color St. Louis' Gateway Arch using your imagination. 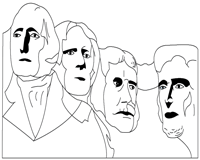 Unleash your creativity with this challenging Mount Rushmore coloring page. Carved on the Black Hills are the faces of the four presidents. Figure out why these presidents were chosen and build your knowledge. Build concentration using this coloring page. Color the famous Lincoln Memorial constructed in honor of the 16th President Abraham Lincoln. 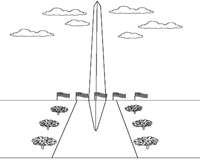 Familiarize grade 4 kids with the significance of the monument. 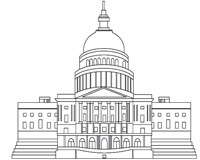 Develop motor, cognitive and spatial skills with this coloring page on the U.S. Capitol Building, the home of the United States Congress. Use your imagination and get as creative as you can. Looking for a refreshing way to learn about the 'Old Glory'? 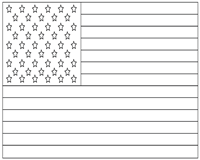 Then try coloring this worksheet using appropriate colors and remember to teach kids of grade 1, the significance of each color in the flag. 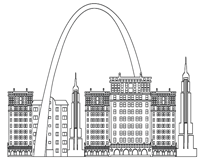 Kick-start your coloring activity with a little chat over where the president resides. 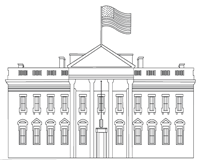 Give 4th-grade kids an opportunity to exhibit their creativity employing this White House coloring page.